Stacey is Barbie's British friend, she is the same sized at 11 1/2" tall, platinum or auburn hair and she can share Barbie's extensive wardrobe. 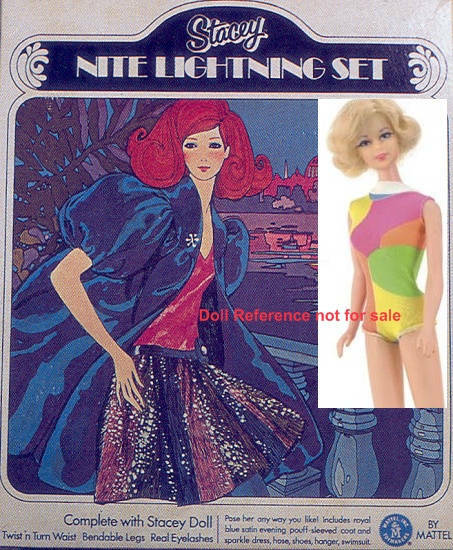 Stacey was only produced from 1968 to 1971 and if you were lucky enough to shop at Sears, you would have found two gift set exclusives for her. These were the only tagged outfits made exclusively for the Stacey doll, other that her original swimsuits. Doll markings are noted below. 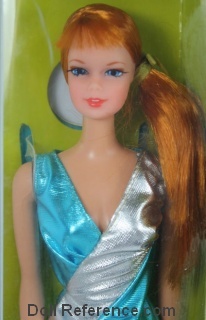 A talking doll with a British accent, has bendable knees, rooted lashes, straight long hair, platinum blonde or titian red head tied on the right with a green ribbon. Two-piece striped swimsuit, clear X stand. Same as 1968 with a new box. Stacey has a bendable knees, TNT waist, rooted lashes, molded teeth, blue eyes, straight long hair, platinum blonde or titian red head. Wearing her red one piece swimsuit, red hair ribbon, clear X stand. Marking: © 1966 Mattel, Inc. U.S. Patented U.S. Pat. Pend. Made in Japan. Features a titian Stacey twist n turn TNT (1165) wearing her red one piece swimsuit with a naval hole and three white buttons. Included is the bright striped knit mini skirt with pink vinyl waistband, pink vinyl jacket front with the rest being the striped knit fabric, striped sleeveless blouse, striped socks, hot pink go-go boots & a pink hanger. 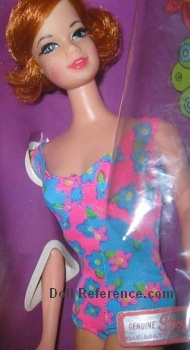 Included the 1165 Stacey doll from 1969 with twist n turn waist shown on right, with a new shorter flip hair do in blonde or titian red head, wearing her new wild multi-colored swimsuit, also included a pink satin cocktail dress with multi colored metallic fringed skirt, blue satin coat with short puffed sleeves, sheer blue hose, blue bow shoes. This gift set was reproduced by Mattel in 2006 as a collectors request. Same as 1968 except now came with a short flip hair do. New one-piece wild print swimsuit. First part of year same as 1969. Late 1970 a new blue and silver lame one-piece swimsuit, hair ribbon, clear X stand, platinum or red head long straight hair with bangs. Late 1970 Marking: © 1967 Mattel, Inc. U.S. & Foreign Pats. Pend. Hong Kong. Same as 1969 first part of year. Late 1970 a new blue, and rose floral swimsuit, clear X stand. Same hair colors and markings as prior Stacey TNT doll.